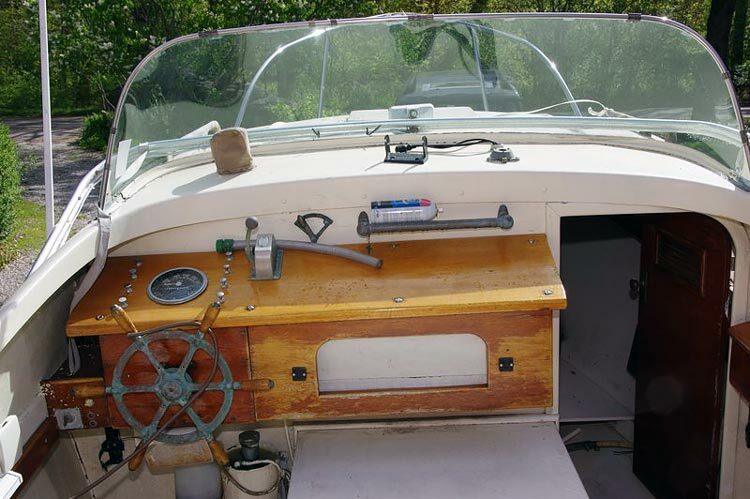 The biggest changes in modern boatbuilding occurred between the years 1940 and 1970. Professional BoatBuilder, in partnership with several museums, announces an exhibition of pioneering designers and builders of fiberglass boats. Fiberglass changed the world. It might not rank with the invention of electricity or the automobile, but fiberglass—and what we today call “composites”—revolutionized not only boating but many other industries as well. Composites are replacing wood and metal in hundreds of applications: telephone poles, bridges, people movers, wind turbines, car parts, airplane fuselages and wings, to name a few. Their uses are nearly limitless. Why? Because properly engineered composites are stiff, strong, and abrasion resistant, and never rot or rust. 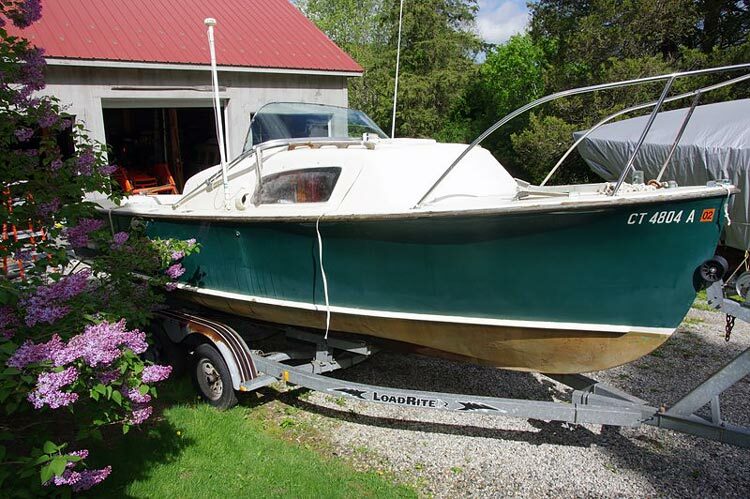 Like most people of my generation, I grew up with fiberglass boats—not that I haven’t owned and loved wood boats, too. When I was a teenager my father bought a wood daysailer so he could race other members of the small club near where we lived outside Ann Arbor, Michigan. I remember well the rites of spring: caulking, painting, and letting her soak up. 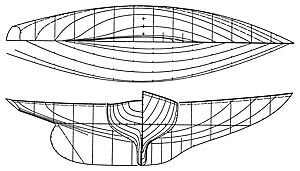 Then one year, Dad announced that the club would make a group purchase of the new fiberglass 12.5′ (3.8m) Tech Dinghy, designed by George Owen, a professor at the Massachusetts Institute of Technology (Cambridge), and he’d agreed to buy one. The boat was super simple and required virtually no maintenance other than removing the rigging each fall and covering the hull. The first boat in my name was a fiberglass Snipe, at one time the most popular one-design sailboat in the world (probably eclipsed since then by the Optimist, Sunfish, and Laser). In the 1970s there were more than 30,000 Snipes worldwide. Thirty thousand of the same exact hull. Such numbers were unheard of. Discounting the elaborate jigs and machinery behind Chris-Craft’s enormous success, wooden boats were not series-produced in great numbers. Taylor Winner’s Trenton, New Jersey–based Winner Manufacturing Co. built the first fiberglass boat for the United States Navy: a 28′ (8.5m) personnel carrier. Chris-Craft had such a huge investment in its wooden boatbuilding operations that it resisted the fiberglass revolution for many years. 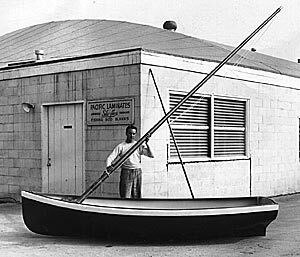 When the company finally saw the writing on the wall, it moved tentatively in 1957 by buying a small Florida company that built this 15′ (4.6m) Lake ’n Sea runabout. 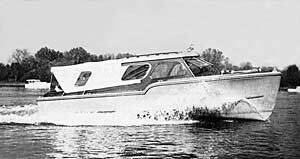 In 1962, Chris-Craft created a research and development center to catch up with the technology. It’s time to convey those stories to a wider audience. Sales of the first fiberglass boats were dismal due to the public’s skepticism about the durability of the new material, which some believed would shatter like window glass. Curtis A. Herberts, a German immigrant who founded successful machinery and aircraft parts companies, also delved into boatbuilding. Here he takes a sledgehammer to one of his Wizard Boats to demonstrate its strength. Finding a one-piece molded hull material was a long-sought goal, unfulfilled by animal skins, papyrus, and even wood timbers. In the United States these efforts included manila-paper-and-glue rowboats commissioned by the Naval Academy in 1868; kraft-paper racing shells coated with shellac in 1900; Henry Haskell and the Duramold Division of Fairchild Airplane & Engine Corporation, which built a cast iron mold and used steam injection and a pressurized rubber bag to produce the first piece of plywood with compound curves; Eugene Vidal’s and L.J. Marhoefer’s 1942 patent utilized by the United States Plywood Corporation to make airplane parts for iconic planes such as the all-wood Fairchild AT-21 Gunner and the De Havilland Mosquito bombers; and Skaneateles Boats (Skaneateles, New York), which cooked eight Hydrolite dinghies in an autoclave. 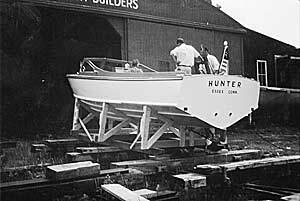 The 23′ (7m) Hunter was purportedly the first fiberglass boat built to Ray Hunt’s groundbreaking deep-V hullform. 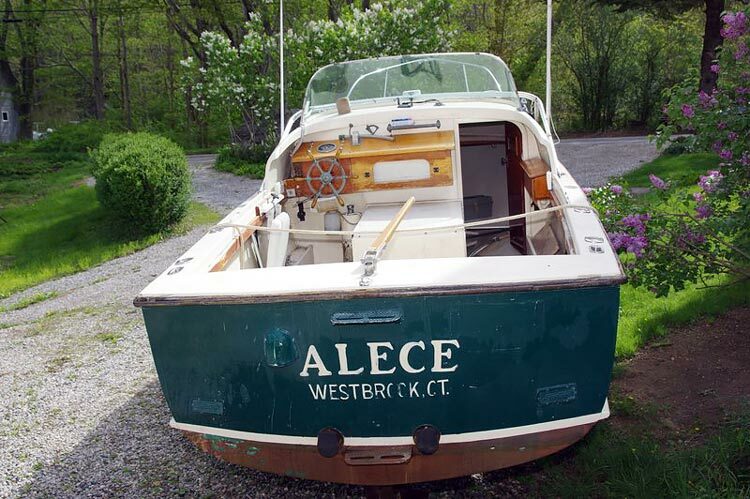 It was one of four built in 1957–58 by The Anchorage, a Warren, Rhode Island, yard owned by Bill Dyer. Proto-plywood in the form of laminated pieces of wood dates to Egypt and China a thousand years ago; and boatbuilders took an interest in plywood after the development of a waterproof adhesive in 1934. During World War II, 30 American mills were producing between 1.2 and 1.8 billion sq ft (111,483,648m2 and 167,225,472m2) of plywood annually. Considered an essential war material, it was used to build PT boats and numerous smaller craft such as lifeboats. Many predicted that after the war, plywood would become the boatbuilding material of choice. That was not to be. New industrial laminates already were becoming household names: Formica, Micarta, Synthane, Aqualite, and others. Though plastic products often were seen as cheap, their infinite moldability and surprising strength offered incredible possibilities to manufacturers who previously had worked mostly in lightweight metals such as tin and aluminum. As early as 1936, Crosley Marine of Coral Gables, Florida, built small plastic boats with ethyl cellulose lacquer, a water-resistant thermoplastic resin that softens when heated. California chemist John Wills said it had the viscosity of varnish and was the same color. It took weeks to dry and had a tendency to shrink. Wills was to play a significant role in the development of polyester resin. In 1942, the 25-year-old Wills was working for Western Plastics Corporation in Glendale, California. “One day,” he said, “two young men walked in the door toting a crude dinghy, which looked like it had been dragged behind a truck. For reinforcement, they used palm fronds that were carded [made into fibers], washed, and dried. [The fronds] were patted onto a greased plaster male mold, one layer after another using a thick ethyl cellulose lacquer as the matrix.” Chris Christenson, owner of Western Plastics, called the process Chemold, and filed for a patent. With it, Wills made a jet-assist takeoff device (JATO) for rocketeer Theodore von Karman, but substituted osnaburg cotton for the palm fibers. Wills left Western Plastics and formed a company with automobile stylist Ralph Roberts to build wherries for the U.S. Navy through the end of the war. Wills improved on the Chemold formulation and called it Lamitex, though ethyl cellulose still had shortcomings, including shrinkage and distortion. As soon as the war ended, Wills & Roberts began series-producing recreational boats, some based on projects they’d worked on for the military; one was a sailing dinghy built from a sea dome lighting buoy mold. 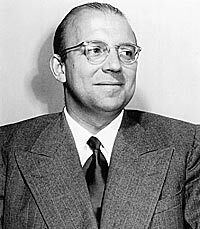 During the 1930s a number of American chemical companies strove to develop a good polyester resin, and it was Carlton Ellis at DuPont who was credited with making the first batch of thermosetting resin. He filed for a patent in 1936, and the formulation found its way to Germany, where it was used in the fabrication of laminated-wood wings for the Me-109 airplane, which were cured in an autoclave. By the time the war began, German chemists had improved on Ellis’s formula to the extent that the German navy used it to build more than 45 patrol boats. British intelligence agents obtained the form­ula and passed it back to American industry. And so it came to American Cyanamid’s “Doc” Griffith, who had perfected melamine resins for the company. Griffith brought with him a field representative from Owens-Corning Fiberglas Corporation who had a sample of woven glass cloth. Griffith catalyzed the resin with benzoyl peroxide (to crosslink the polyester molecules in the process called polymerization) and saturated several plies of the cloth with it. They were placed between waxed cauls under low pressure. Wills says that after heat was applied, the resin cured in about three to five minutes. These experiments may have been the first time polyester resin and glass fibers were combined. Where those fibers came from is essentially the story of Owens-Corning Fiberglas, whose progenitors were Owens-Illinois Glass Co. and Corning Glass. The former, a maker of milk bottles, recycled excess glass as mineral wool. Then in 1931, a consultant named Games Slayter noticed fibers clinging to the roof joists in the plant. He and the company had the idea of marketing the fibers as filtration media and as insulation for buildings. But how would they produce them economically? Slayter and Owens-Illinois employee Dale Kleist experimented with compressed air blown over molten glass, and then steam blown over the glass. But it was not until 1941 that Owens-Corning found a way to clean the fibers to make them suitable for laminating parts like boats. Confident that it had a revolutionary product, Owens-Corning sent its salesmen in force across the country to introduce the product and teach builders how to work with it. Many early glass builders remember visits from Boughton “Tony” Cobb, manager of the company’s Reinforced Plastic Boat Division. To help promote fiberglass-reinforced plastic (FRP) construction, Cobb wrote several articles on the subject for Yachting magazine. To further advance the technology in the boatbuilding industry, Owens-Corning commissioned the naval architecture firm Gibbs & Cox to write Marine Design Manual For Fiberglass Reinforced Plastics. Published in 1960, it was for many years the bible for engineering marine composites. 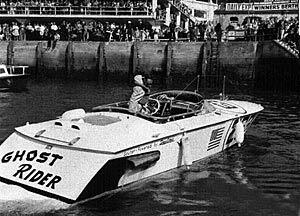 Palmer Scott was one of many boatbuilders who made the transition from wood to fiberglass. Palmer Scott, 1898-1970, began building boats as a carpenter for George Lawley in Neponset, Massachusetts. Later, he bought William Hand’s yard in Fairhaven, but lost it all in a fire less than a month later on January 10, 1938. He started again in New Bedford, in an old mill that was severely damaged by the great hurricane of that year. A visit by Dr. Irving Muscat in 1946 or 1947 got Scott interested in fiberglass, and so he adopted Muscat’s Marco Method in which resin is draw up from a reservoir between two metal mated molds by vacuum. His most popular fiberglass model was the Rhodes 19 sailboat, but history will also remember him for building the first deep-V powerboat, in wood, designed by C. Raymond Hunt. 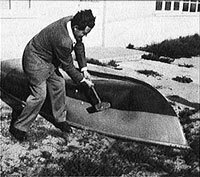 Though others built plastic boats before World War II, Ray Greene is believed to have built the first fiberglass-polyester boat, in 1942. 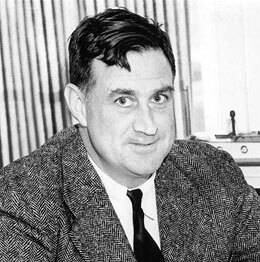 He put himself through college by building wood Snipes, earned two engineering degrees at Ohio State University, produced the 16′ (4.9m) Rebel daysailer in 1948 (among thousands of other fiberglass boats), built the fiberglass body for the Kaiser Dragon automobile in 1953, and was sent by the United States Navy’s Bureau of Ships to teach the Vietnamese how to build fiberglass swimmer-support boats. 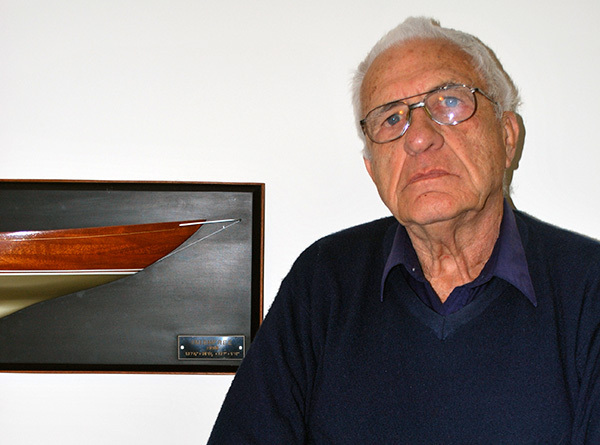 His Ray Greene & Company plants suffered major fire damage in 1950 and 1965, and he retired from boatbuilding in 1975. Several pioneers in fiberglass boatbuilding were notable builders in wood before World War II: Henry Hinckley of Southwest Harbor, Maine; Carl Beetle of New Bedford, Massachusetts; and Ernest Goodwin of Wareham, Massachusetts, who obtained government contracts to build wood boats such as picket boats, tugs, and mine yawls for the U.S. Coast Guard and Navy. Others served in the armed forces, principally the U.S. Navy, where the earliest experiments with fiberglass gave them a head start in applying the new materials to boats for recreational use soon after the war ended in 1945. That was the case with Ray Greene of Toledo, Ohio. Born in 1913, he began building boats at age 12, and by the time he was a teenager he had a small business working out of the family garage. He even paid his own tuition at Ohio State University by selling wooden Snipes. Brilliant and inquisitive, Greene was keen to discover a new and better material for making hulls, even writing his thesis in mechanical engineering on the subject (though his professor made him substitute “large object” for “boat”). Greene’s first plastic boats employed screen wire, unbleached muslin, brown paper, and “everything else you can think of” for reinforcements; resins were largely urea formaldehyde. Fortuitously, Owens-Corning had a plant in Toledo, and Greene was commissioned to make some experimental rocket tubes for the company. So when the first batch of new glass fibers was made available, Greene was allowed to buy half, making boat models with urea formaldehyde resin and then curing them in a 3′ (0.9m) autoclave. Just as Jack Wills in California was lucky to receive from American Cyanamid’s Griffith an early batch of polyester resin, Greene was given a gallon (3.8 l) of polyester resin from the same company. He probably used it to wet out the fiberglass for the 8′ (2.4m) Tubby Dink, which he’d previously been building in wood. As best researchers can tell, this was the world’s first polyester-fiberglass boat. The year was 1942. One of the most notable designs to make the shift from wood to fiberglass was Philip Rhodes’s 39′ (11.9m) Bounty. Beginning in 1939, Fred Coleman’s AeroMarine, in the San Francisco Bay Area of California, series-produced the boat in wood, with an elaborate set of jigs. In 1956, he had Rhodes modify the design for fiberglass construction. A wood Bounty sold for $4,195; a 41′ (12.5m) fiberglass Bounty II sold for $18,500. 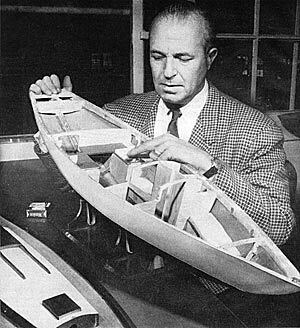 Fred Coleman inspects a model of the Bounty II. 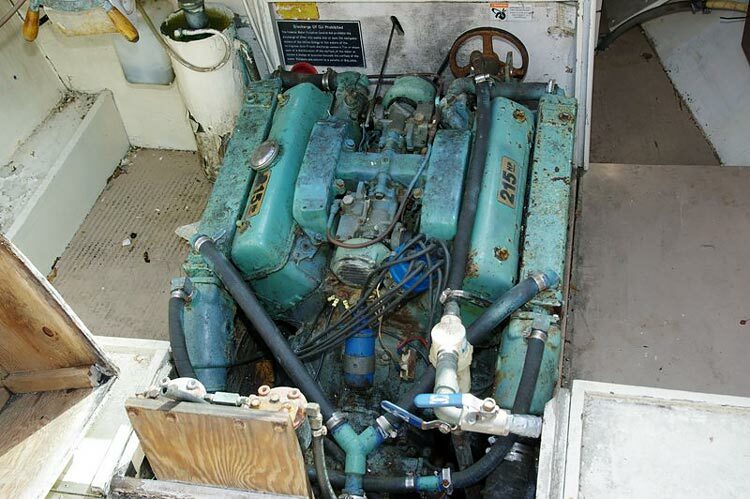 More than 100 of the boats were eventually built, the last as the Rhodes 41 by Pearson Yachts after that company and AeroMarine were acquired by Grumman Allied Industries. It eventually liquidated AeroMarine, and consolidated operations at Pearson’s plant in Rhode Island by 1963. In the years after the war, Greene built thousands of boats in fiberglass, from the Tubby Dink to the 16′ (4.9m) Rebel daysailer to airboats and the first Sparkman & Stephens design for fiberglass—the 25′ (7.6m) New Horizons cruising sailboat. There were, of course, many other builders and designers who rode this wave of change, some to fame, others to disillusionment and bankruptcy. Most risked their careers for the love of making things and for the love of boats. In the early years of fiberglass boat production—the late 1940s and early 1950s—the public was rightly skeptical of the often-outlandish claims made for this new material. Over time, however, the amazing tensile strength of glass fibers, their ability to take virtually any shape imaginable, their low maintenance, and their immunity to corrosion and rot soon changed those attitudes. The new material proved capable of delivering affordable, seaworthy models to a growing boating public. Today, production boatbuilding is a billion-dollar industry in the U.S., thanks largely to the inventiveness and perseverance of these and other glass pioneers whose names and stories and boats we will present at www.proboat.com/category/wood-to-glass/. It is our hope at Professional BoatBuilder that readers will share their experiences on the site and send us photos and reminiscences that bring forth from the shadows the names and faces of those all-but-forgotten leaders. About the Wood to Glass Exhibition: To give our industry’s forebears due credit and respect, Professional BoatBuilder is partnering with Mystic Seaport (Connecticut), the Mariners’ Museum (Newport News, Virginia), and the MIT Museum (Cambridge, Massachusetts) to create first a Web-based exhibition, and later a physical exhibition, telling the story of boatbuilding from 1940 to 1970. Already we have collected drawings, photographs, and even a few boats to get this project up and running. But we’re counting on input from the industry, magazine readers, and museum patrons to make this a success. If you have questions, ideas, images, or materials to contribute, please e-mail editor-at-large Dan Spurr at dan@nullproboat.com. Obituary of John B. Owens Recaps History of Owens Boat Co.